California is the poster child for solar energy: in 2016, 13% of the state’s power came from solar sources. According to the Solar Energy Industries Association, California is in the lead for the cumulative amount of solar electric capacity installed in 2016. In fact, the California is generating so much solar energy that it is resorting to paying other states to take the excess electricity in order to prevent overloading power lines. According to the Los Angeles Times, Arizona residents have already saved millions in 2017 thanks to California’s contribution. The state, which produced little to no solar energy just 15 years ago, has made strides — it single-handedly has nearly half of the country’s solar electricity generating capacity. According to the U.S. Energy Information Administration, California reached a milestone: for a few hours, more than half the state’s power needs were sourced from solar energy. This put wholesale energy prices in the negative. When there’s too much solar energy, there is a risk of the electricity grid overloading. This can result in blackouts. In times like this, California offers other states a financial incentive to take their power. But it’s not as environmentally friendly as one would think. Take Arizona, for example. The state opts to put a pin in its own solar energy sources instead of fossil fuel power, which means greenhouse gas emissions aren’t getting any better due to California’s overproduction. California’s state goal is to get 50% of all its electricity from renewable sources by 2030. Solect Energy and Green Street, members of SunPower’s national dealer network, have developed two SunPower solar systems totaling 6.9 MW that will provide electricity to 10 Massachusetts schools. In Easton and in partnership with SunPower, Solect Energy has constructed a 2.8 MW SunPower solar carport system at Stonehill College. The Catholic liberal arts college will buy electricity generated by the system under a power purchase agreement (PPA) arranged by SunPower. The system is expected to meet about 20% of the college’s energy needs and joins other solar projects previously installed at the school. In Bridgewater, Green Street has developed a 4.1 MW SunPower Helix Roof system at Ajax United Drive LLC. Green Street will own the off-site solar power system – as well as the associated renewable energy credits – while Attleboro Public Schools will buy the power produced through a PPA, saving an estimated $3 million over 20 years, according to SunPower. Energy from the system is expected to meet about 75% of electricity needs for five elementary schools, three middle schools and one high school. According to SunPower, a total of about 90 workers contributed to both the Stonehill College and Attleboro Public Schools installations during peak construction. SunPower says its solar technology has helped a number of Massachusetts schools save on energy costs, including Cape Cod Community College, Clark University, Edgerly School, Harvard University, and University of Massachusetts Lowell. “Solar allows Stonehill to set an example for our students, faculty, and staff by prioritizing sustainability and stewardship of the planet and its resources,” said Michael Shulansky, Associate Director of Communications and Media Relations at Stonehill College. “Furthermore, our solar installations have helped transform us into a leader in energy efficiency, and provide increased visibility of the College to environmentally conscious students, parents, and communities,” he added. Financed by SunPower, a global leader in solar innovation, the solar canopies allow Stonehill to experience predictability in energy costs throughout the 20-year lifespan of the system while also reducing the school’s reliance on carbon-based fuels. Solar power is cheaper than ever and it will revolutionize the world. In 2014 Burlington, Vermont became the first city in the United States to run on 100% Renewable Energy. But how do they actually do it? What’s their secret? On the last weekend of April, as the breeze was blowing and the sunshine was beaming, two-thirds of Germany’s electricity came from renewable energy sources. On Sunday, April 30, an average of 64 percent of electricity consumed in Germany came from renewable sources, according to data by German think-tank Agora Energiewende. At around 2pm, the share of renewables rose to 85 percent and from 10am to 6pm over 75 percent of demand was covered by clean energy. Most of this push came from solar power plants, closely followed by a large contribution from wind farms (see graph below). That weekend also saw the least amount of coal the country has burned up “in recent history” and nuclear power plants reduce their output by up to 40 percent. This situation will “be completely normal” by 2030, according to Dr Patrick Graichen, the director of Agora Energiewende. These goals have been made a reality through the government’s policy of Energiewende, one of the most extensive pushes towards low-carbon energy sources in the world. In recent years, this initiative has seen the country pump €1.5 billion ($1.63 billion) a year into clean energy research. As a result of all this work, they hope to reduce greenhouse gas emissions by 40 percent below 1990 levels, and slash them by at least 80 percent by 2050. A key part of this program is to totally phase out nuclear power by 2022. So much energy was produced on April 30, it was accompanied by “negative prices” for several hours at the electricity exchange. This means that people were effectively being paid to consume electricity, in a roundabout way. Although that’s good news for the average Joe, it shows that the issue of energy transition can be a thorny one. Outside of Germany, many other countries are pushing to cut their greenhouse gas emissions and move towards clean energy. Just last month, the United Kingdom experienced its first day since the Industrial Revolution when it didn’t burn coal. It’s a time of renewed public activism across America. Case in point: We’ve just seen hundreds of thousands of people march in Washington to stop climate change, and just weeks before that, we witnessed the “March for Science”. Of course, these marches took place just months after the “Women’s March” and built upon the unbridled community activism that we see happening in communities from coast to coast with “Huddles” and “Indivisible” other vestiges of renewed political and community organizing. If there’s one thing that’s been proven since the election in November of 2016, it’s that people from all political persuasions have been activated and motivated. Well the folks at Yale University, Duke University, the US Department of Energy, the Connecticut Green Bank and my non-profit organization SmartPower, have a way to channel that energy. Recently we released a groundbreaking study that makes it easy for all Americans to go Solar. Solarize Your Community is the road map that allows each of us to turn our passion into action. The “Solarize” program was created back in 2007 in Portland, Oregon, where one visionary and enthusiastic homeowner gathered nearby friends and neighbors to aggregate their purchases of solar energy. The City of Portland and the Energy Trust of Oregon joined to support the outreach effort, and the result was a near tripling of the number of solar installations expected. This model was later refined with great success by the Massachusetts Clean Energy Center. 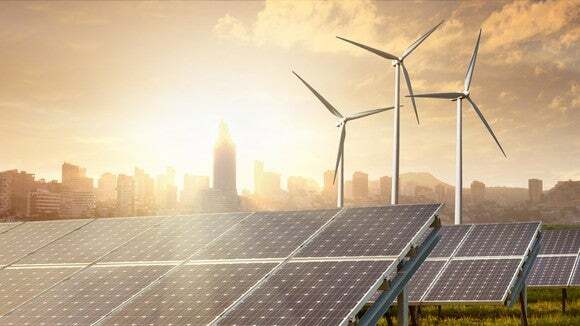 Subsequently, my nonprofit, SmartPower, after modeling a successful solar outreach effort in Arizona, teamed up with the Connecticut Green Bank and brought Solarize to Connecticut. We are well on our way to perfecting the model. The Solarize model starts with selecting communities and identifying the “Solar Champions” within those communities. Then, together, through a competitive process, we select a contractor that will serve as the approved and “vetted” solar installer during the time-limited Solarize Campaign. During the campaign we provide outreach and education through town volunteers, solar ambassadors, and local community groups and organizations — all coordinated and managed by SmartPower. Typically, the campaigns run between 16 and 20 weeks in each community. 1. Cost. Solarize offers a reduced initial price because of the “group purchase”. Add in zero down financing thanks to companies such as San-Francisco-based Dividend Solar and cost becomes less and less of an issue. 3. Complexity. We’ve removed the confusion and complexity in buying solar because the pricing and the installer for Solarize campaigns have been screened and competitively selected; the consumer is not overwhelmed with technical details and financial confusion. 4. Inertia. Finally, every retailer knows a good “Sale” drives in customers. So our campaigns create a clear end date that ensures consumers are motivated to take action, shortening the decision making process. Which brings us to the release of this Guidebook. Solarize Your Community is the result of three years of intensive on-the-ground testing and implementation in cities and towns across Connecticut. By tracking SmartPower Solarize Campaigns throughout the state, Yale University economist Kenneth Gillingham and Duke University marketing Professor Bryan Bollinger have pinpointed the most powerful levers for boosting residential solar adoption. With the learnings of this research, we created a proven model — a “recipe” for success, if you will — that any city or town in the nation can replicate. This research has revealed that a well-run Solarize program triples the number of rooftop installations in a community and reduced the average cost of residential solar by 20-30 percent. And as if that weren’t enough, Solarize also creates local jobs and streamlines what has traditionally been a cumbersome permitting process. Further, Gillingham and Bollinger found that customers in Connecticut’s Solarize program were overwhelmingly satisfied with their installations, and more than 80 percent would recommend (or have already recommended) solar to others. This helps to explain why 20 percent of those who chose to go solar under this model had never before thought about acquiring solar power. Solarize helps “break through” to the next tier of American consumers. In other words, these campaigns increase residential solar market share beyond those who are naturally inclined towards purchasing solar to those consumers who haven’t traditionally considered themselves “Green”. At the heart of the program’s success is the “contagious” property of solar installations—the way that neighbors’ installations influence peers. Over a six-month period, the presence of one solar rooftop project increased the average number of installations within a half-mile radius by nearly 50 percent. Let that sink in – 50 percent! This peer influence effect proved even stronger if the panels were visible from the street. And it makes sense. If neighbors see someone else on the block, someone they know and trust, installing solar panels, then they’re more willing to take the leap themselves. So through Solarize we are are able to build a “Tipping point” for residential solar, street by street, community by community, and city by city—faster, and cheaper, than ever imagined. And we can do this with huge amounts of customer satisfaction. Now it’s your community’s turn. With this guidebook there’s no excuse for not going solar. In this age of renewed activism among the American people, “Solarizing” seems to be the perfect way to pass the time between “marches on Washington”. So download the guidebook here – and let’s Solarize! With so many trendy investment opportunities available in today’s day and age, it’s easy to be skeptical of new products that boast promises of “saving you tons of money.” Solar panels are no different – saving money through reducing your electric bill is one of the main appeals and selling points for solar as a product and home upgrade. The simple answer to the question “do solar panels really save you money?” is yes. That being said, how much you’ll save depends on a number of factors. Direct hours of daily sunlight and size and angle of roof are both important, but local electricity rates play the biggest role in determining how much solar can save you. How much do solar panels save on electric bills? The first step to understanding how much solar can save you is to calculate how much you are currently spending on electricity every year. For example, the average annual electricity use required for a U.S. household is 11,000 kilowatt-hours (kWh). Multiply that by the national average electricity rate as of September 2016 ($0.1287 per kWh) and you’ll find that the typical American family is spending over $1,400 a year on electricity alone. Then, you have to consider the volatile nature of electricity prices and determine what utility rates will be in years to come. When you compare the cost of utility electricity with home solar, you should keep in mind that you can expect electricity rates to increase annually. Over the past decade, national electricity costs have increased at a rate of 2.2% per year. Utility rate inflation is an added incentive for solar: when you generate your own energy with a rooftop PV system, you’re taking control of energy costs so that you are no longer victim to variable utility rates. Because of the nature of solar as an up-front investment, the only costs associated with a solar system will be the cost of your installation and any added electricity costs in the event that your panels do not completely offset 100% of your electricity use. Whether or not your system will completely offset your electricity needs is primarily determined by how accurately you size your PV system – you can calculate how many solar panels you’ll need to secure that percentage. How much can solar panels reduce your carbon footprint? Financial returns are a major incentive for going solar, but money isn’t the only thing that solar panels save. When you install solar, you’re also improving the environment and reducing greenhouse gas emissions. That’s why the question “How much can solar panels save?” can be answered two ways: how much money solar can save and how much CO2 it can save (avoid being emitted into the atmosphere). The Environmental Protection Agency provides a formula to help you calculate how various green practices result in carbon emissions reductions. The below table converts solar energy production into greenhouse gas offsets using the metric converters 7.03 × 10-4 metric tons CO2 / kilowatt-hour of energy produced and the national average for solar panel production ratio, 1.42 kilowatt-hours / watt of power. A good comparison point to use when thinking about carbon emissions is that a typical vehicle emits 4.7 metric tons of carbon dioxide every year. When you take into consideration that the national system size average in the U.S. is 5 kW (5,000 watts), it’s easy to think about a solar panel system as something that can typically offset the emissions produced by one fossil fuel automobile in a year. In addition to significant bill savings, a solar system comes with the satisfaction of “taking a car off the road,” so to speak. Ultimately, regardless of whether you’re looking at finances or carbon emissions, a solar panel system will generate big savings for homeowners. As the first data table illustrates, 20-year electricity savings from solar can be significant, ranging from the low end of $7k to upwards of $30k. The deciding factor will primarily be the cost of electricity, which varies significantly depending on where you live. Nonetheless, a good rule of thumb is if you live in a state with middle- to upper-level utility rates, solar will be a risk-free investment with major returns. On the emissions side, as panel system size increases, so do the CO2 reductions in the surrounding environment, making solar an eco-conscious investment. If you’re looking for customized estimates not only around potential solar savings but also around the cost of a solar panel system, try our Solar Calculator. If you’re ready to start looking at quotes from pre-screened solar contractors in your area, check out the EnergySage Solar Marketplace. Cost-effective energy storage could change how the electric grid runs around the world. The biggest criticism of wind and solar energy has long been their variability as sources of energy for the grid. The sun is only out during the day, and the wind doesn’t blow 24/7. They’re not great “baseload” sources of electricity, and their variability can make the rest of the grid harder to manage (see California’s “duck curve”). To solve this challenge, cheap and abundant renewable energy needs to be moved from when it’s produced to when it’s needed. Energy storage is the answer, and it’s becoming big business faster than you might think. The estimates of energy storage’s growth are incredible. According to GTM Research, energy storage installations in the U.S. totaled 260 MW in 2016 and the industry will grow to 478 MW in 2017 and 2,045 MW in 2021. Furthermore, Bloomberg New Energy Finance projects that 25 GW of energy storage will be installed worldwide in the next 12 years from less than 1 GW today. But that’s assuming battery prices fall to $120 per kWh by 2030. These are high growth estimates, but they may not be bullish enough. Estimates are that Tesla‘s (NASDAQ:TSLA) costs are already below $190 per kWh and GM has reportedly gotten cell prices as low as $145 per kWh, and prices on the market are already trending lower than industry experts think. Eos Energy, which makes a zinc hybrid cathode Znyth battery, recently announced that it’s taking orders for energy storage systems at $160 per kWh for delivery this year and at $95 per kWh for 2022 shipments. This is the lowest price I’ve ever seen quoted, but it’s probably just the beginning. Tesla has been an industry leader so far, and with the company projecting lower costs from the scale of the Gigafactory, it could be below $100 per kWh for utility-scale projects by 2022. The $100 per kWh level would only be a reduction of 12% annually based on costs reported in 2016, which is very manageable for an industry cutting costs rapidly. At $95 per kWh, Eos estimates the levelized cost of energy storage is approximately $50 to $60 MWh, or $0.05-$0.06 per kWh. With wind and solar prices now at $0.02-$0.05 per kWh, energy storage could be economical in many states in the U.S. and countries around the world. 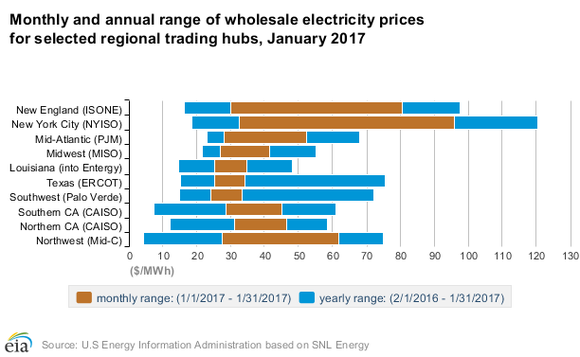 The chart below shows the range of wholesale electricity prices in different trading hubs across the U.S. You can see that electricity at $70 to $110 per MWh ($0.07-$0.11 per kWh) would be competitive in the Northeast and at times in other parts of the country as well. IMAGE SOURCE: U.S. ENERGY INFORMATION ADMINISTRATION. Ultimately, it’s these wholesale markets where wind and solar plus storage will be very disruptive. Fossil fuels can’t keep storage applications out of the wholesale market, and with the price of renewables and energy storage coming down, the market gets bigger and bigger by the day. On a per-kWh basis, wind and solar energy are already competitive with fossil fuels in most of the U.S. and much of the world. Their only problem is their time of production, a problem that’s solvable with energy storage. As we see lower-cost energy storage solutions emerge — whether it’s lithium-ion batteries, other battery chemistries, mechanical storage, or other methods — the renewable energy industry will only grow. Expect the disruption to continue, and within the next few years, energy storage may be the most disruptive energy innovation we’ve seen since Thomas Edison unveiled the first electric grid over a century ago. David and Tom just revealed what they believe are the ten best stocks for investors to buy right now… and Tesla wasn’t one of them! That’s right — they think these 10 stocks are even better buys. Travis Hoium has no position in any stocks mentioned. The Motley Fool owns shares of and recommends Tesla. The Motley Fool has a disclosure policy.